As a boy growing up in South Korea, Eugene Roh traveled to Seoul in 1988 to attend the Summer Olympics. 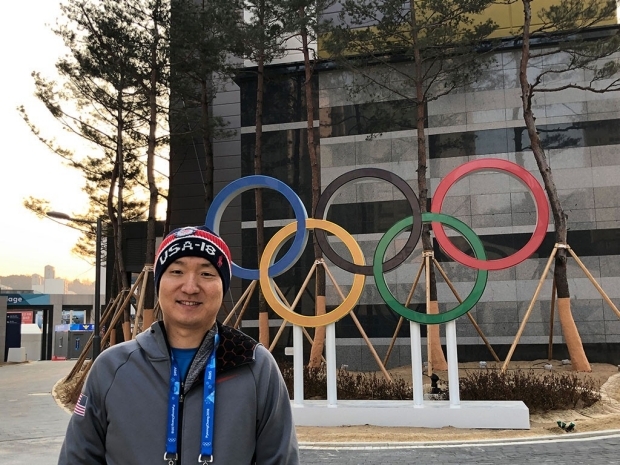 Now a clinical assistant professor of orthopaedic surgery at the School of Medicine, Roh, MD, is returning to his native country as a physician for Team USA at the 2018 Winter Games. Roh is an expert in sports medicine and treats patients in the Stanford Orthopaedic and Sports Medicine Clinic in Redwood City, as well as Stanford athletes at the Sports Medicine Center at the Arrillaga Center for Sports and Recreation. He specializes in nonoperative diagnosis and treatment of musculoskeletal injuries using ultrasound and regenerative medicine. Recently, writer Grace Hammerstrom got a chance to ask him some questions about his interest in the Olympics and working with athletes. Q: Where does your fascination with the Olympics come from? Roh: Everything started when I went to the Olympic Games in Seoul with my middle school class in 1988. It was such a pivotal memory in my life. Since finishing my fellowship training in sports medicine and starting my career, I have always been interested in working at the Olympics. And since South Korea, the country where I was born and raised, is hosting again, the timing was right. Q: Why did you want to be a physician for the Olympics? Roh: Being part of Team USA is a once-in-a-lifetime experience, a dream come true. It’s a chance to work with the best medical team in sports medicine, as well as the best athletes in the world. It is also an opportunity to give something back to the country that has provided me so many opportunities. I’m looking forward to sharing the experience with my wife and son, and introducing my son to two cultures, American and Korean, at the same time. Q: How did you become a physician for Team USA? Roh: I started looking for an opportunity once it was announced that Korea would host the 2018 Winter Olympics. I was introduced to Bill Moreau, the United States Olympic Committee medical director, when I went to Korea to attend a sports medicine conference. 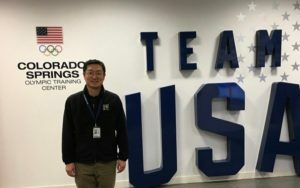 Bill invited me to the U.S. Olympic Training Center in Colorado Springs, where I volunteered to work with the athletes. Since I am trained in internal medicine, physical medicine and rehabilitation, and sports medicine, I was able to see patients with a spectrum of sports-related injuries and internal medicine conditions. The Olympic Training Center also uses sports ultrasound, which I routinely use at Stanford. Ultimately, I was offered a position as a physician for Team USA. Interestingly, the Korean Olympic Organizing Committee had simultaneously invited me to be a venue medical officer for ice hockey. I had to decide between being part of the medical team for Korea, my home country, or the United States, my new home and the country where I live and have a family. I chose to be a physician for Team USA, which is bringing the largest group of athletes to the games. But I will be working as a liaison between both medical teams. Q: What will you be doing at the Olympics? As a Team USA physician, I will be in Korea for a month, arriving a week before the Olympics start and staying until the games end. I will be helping to set up the USOC medical clinic on the first floor of the USA athletes’ village, and then seeing athletes in clinic. If there are events that need medical coverage, I will be onsite at those games as well. Essentially, I will be on call the entire time. I will also be working at the ice clusters venue where ice skating and ice hockey take place. Q: What do you enjoy about working with athletes? They really inspire me. At Stanford, athletes have to be really dedicated to do sports and academics and balance their lives. Their discipline and passion about what they like to do is inspiring. It’s not easy work. In those moments where we all feel settled in life, and get a little lazy, we look to the athletes who inspire us to catapult ourselves to the next level. Treating these athletes and then seeing them being able to go back and play at a high level gives me a lot of fulfillment. I don’t care if they score or not. I am gratified by the basics of their walking or moving their arms, especially if they were in severe distress prior to their treatment. If they’re able to move well again, it’s rewarding. If they do really well, it’s a bonus. Courtesy of Stanford Medicine News Center. Written by Grace Hammerstrom a freelance writer.